The University welcomed a delegation from the Indonesian Audit Board and the Ministry of Research, Technology and Higher Education (RISTEKDIKTI) earlier this month. The visit, led by Mr Achsanul Qosasi, Auditor General of the Audit Board in Indonesia and accompanied by Mr Agus Susilohadi, Deputy Director of Planning and Budgeting for Directorate General of Resources, Science and Higher Education, explored research carried out by government-funded Indonesian students at the University. 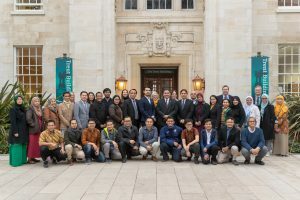 Nottingham is an exemplar of close collaboration between the UK and Indonesia and was the only UK University the delegation visited this time. The group also witnessed the launch of Indonesia Doctoral Training Partnership (IDTP), a new initiative established in partnership with RISTEKDIKTI following their visit in July. The defining principle for IDTP is a shared vision and commitment to foster a new generation of Indonesian academic leaders to tackle world challenges. This supports the Indonesian government’s skills and leadership agenda in Higher Education. Mr Achsanul acknowledged the support the University of Nottingham has provided for Indonesian students and spoke about the Audit Board’s vision of funding education to benefit society and the economy. Addressing the students and staff at the University, Mr Achsanul also emphasised the role of the Audit Board in state finance and their work in funding Higher Education. Another highlight of the visit was meeting both Indonesian government funded PhD students and their supervisors who exemplify UK-Indonesia research links. Kurnia Ramadhan, a PhD student in Food Sciences and a member of EPSRC Centre for Innovative Manufacturing in Food, performed a 3-minute thesis presentation on the topic of ‘modulating the structure of plant-based high protein foods.’ The application of his research will provide a wider range of food options for consumers who are shifting into or increasing their vegetable-based diets.